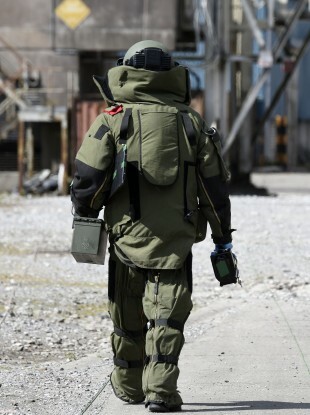 THE DEFENCE FORCES dispatched a bomb disposal team to a scene in Tullamore, Co Offaly, today where they made safe a suspect improvised explosive device (IED). At the request of An Garda Síochana, the army team was called in, arriving at 2.40pm. A number of homes were evacuated as a precaution, while a cordon was set up in the immediate area. The bomb disposal team made an assessment of the situation, and proceeding to defuse the device. The suspected bomb was then removed by the defence forces for further examination. Evidence was handed over to gardaí to assist them with their investigation. Email “A number of homes evacuated as bomb disposal team attend scene in Tullamore”. Feedback on “A number of homes evacuated as bomb disposal team attend scene in Tullamore”.